Premium water systems that embody innovation, wellness and sustainable change. US Coffee has teamed up with Vivreau, an industry leader in premium, high-quality table water. All Vivreau water is “mains-fed,” meaning water is drawn directly from your central water system and then filtered to purity without stripping away essential minerals. Vivreau offers versatile water systems including high volume and countertop bottle coolers, stylish single-serve taps, and eye-catching custom-branded bottles. The Vivreau mission is simple: to provide high-quality water in an environmentally responsible, health-promoting way that fits with any business’s unique objectives. Together we strive to help companies make better, more responsible water choices. Why should you consider a Vivreau water system for your office? Replacing traditional bottled water with Vivreau on-site bottling systems, reusable glass bottles, and Vi Taps has helped hundreds of clients become more environmentally responsible. 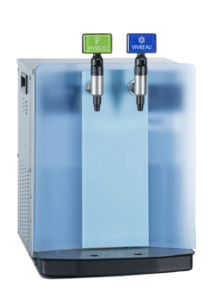 Introducing a Vivreau system into the workplace makes water easily accessible and encourages employees to choose water over less healthy beverages; a key part of corporate health & wellness. A Vivreau water system is a long-term investment on a healthy bottom line. Vivreau water systems eliminate dependence on costly and wasteful and single-serve plastic bottled water. Vivreau custom branded glass designer bottles are an unforgettable showcase for your brand and communicate your environmental stewardship stance to a captive audience. A unique Vivreau water solution to fit every office. 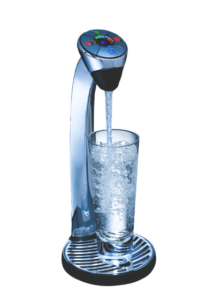 Vivreau’s award-winning Vi Tap, a signature system in our portfolio, is the perfect water dispenser to suit all your needs at the touch of a button. Simple, easy and effective. 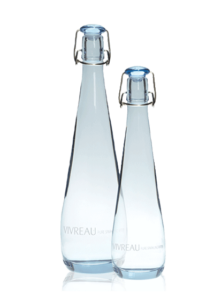 Vivreau is the original designer of the table water bottling system, effectively transforming how water is served and consumed in corporate settings. 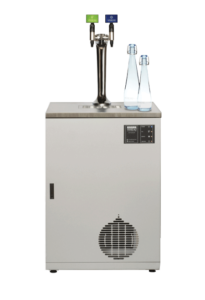 The countertop range of bottlers from Vivreau harness the output of our high volume bottlers while preserving the smaller footprint of our Vi Tap. Our proprietary, designed by Vivreau bottles are manufactured with high grade commercial glass, making them extremely durable and reusable for many years. Interested in a Vivreau water system? Contact us! What type of Vivreau water system are you interested in? Vi Tap DispensersHigh Volume Water Bottle SystemsCountertop Water Bottle SystemsExclusive Vivreau BottlesI'm not sure yet - let's discuss!